Costa Rica is located in Central America between Panama and Nicaragua. It’s location provides some of the most unique biodiversity in the world. Although Costa Rica is quite a small country you can find a huge variety of natural destinations right next to each other. In fact, in one day you might visit a beach, waterfall, nature reserve, cloud forest, wildlife refuge, volcano, and tropical rainforest! What makes Costa Rica so amazing, though is it’s abundance of tropical rainforests that make up a majority of the country. Rainforests are tropical forests that receive a large amount of rainfall. There 13 different kinds of rainforests in the world and each are made up of distinct flora and fauna, wildlife and microclimates. The tall trees create a canopy, where you can find many animals, insects and bird species living happily. Some of the more famous animals found in rainforests of Costa Rica are sloths, howler monkeys, white-faced capuchin monkeys, scarlet macaws and poison dart frogs. Rainforests are the reason Costa Rica has so many national parks, protected areas, wildlife refuges, and such a vast diversity of flora and fauna. They are the reason why you’ll find a huge variety of wildlife and hiking trails. Rainforests come in many shapes and sizes. Thanks to Costa Rica’s ecosystem you’ll find 6 kinds of forests throughout the country. Keep reading to find out about the different kinds of rainforests in Costa Rica and what makes them so extraordinary! You will find rainforests in Costa Rica almost everywhere. Manuel Antonio, the Osa Peninsula, Monteverde, and Tortuguero are just a few examples. In fact, in each region the forest types are different. You will find the traditional rainforests in the Osa Peninsula and Tortuguero. Whereas on the northern Pacific side, or Guanacaste to be exact we see the dry forests. Lastly, not far from San Jose there is the Cloud Forest of Monteverde. Each type is beautiful and makes Costa Rica one of the most biodiverse countries in the world. Tropical rainforests are characterized by massive canopies that allows lush vegetation to thrive on the ground, and heavy precipitation. In Costa Rica, tropical rainforests get over 200 inches of rain every year! Costa Rica Tropical Rainforests are also characterized by the diverse and numerous animal species found there. Enter any tropical rainforest and you’ll immediately hear the screaming howler monkeys, squawking scarlet macaws and croaking frogs. Look close and you’ll see sloths, snakes, bats, and several insect species. You probably won’t see any large tropical cats, but they do live there! Tropical Rainforests are also the best place to find adventure in Costa Rica. From zip lining to white water rafting to horseback riding to ATV tours. Popular Tropical Rainforests in Costa Rica include Corcovado National Park in the Osa Peninsula, Manuel Antonio National Park, Cahuita National Park and Carara National Park near Jaco. Tropical Dry Forests are mostly found in the Guanacaste region of Costa Rica, where elevation is lower and there is a lot less rainfall and precipitation. You might notice that Tropical Dry Forests seem to have less vegetation than the tropical rainforest. The lower density of vegetation can actually make it easier to spot the white-faced capuchin monkeys, sloths, iguanas and resplendent quetzals that live there. Popular Tropical Dry Forests in Costa Rica include Rincon de la Vieja National Park, Santa Rosa National Park and Palo Verde National Park. Don’t miss out on the incredible hiking trails that wind through the parks as well as adventure tours. Enjoy horseback riding, white-water rafting, zip lining, kayaking and mountain biking! If you want to see some of the tallest trees in Costa Rica, visit a lowland rainforest! Found in areas 0-1000 meters, Lowland Rainforests experience a lot of rain and a lot heat all year long. They host several different micro environments, meaning they support diverse plant and animal life. You’ll find a variety of tropical cats like pumas, bird species like toucans, frogs and bats. Probably the most popular Lowland Rainforest is found in Tortuguero National Park. You can explore the rainforest on foot or by boat! Animals are usually less threatened by boats or kayaks, so we recommend a boat tour. The Cloud Forests of Costa Rica are truly incredible. Cloud Forests are located at higher elevations and are named as such because of their constant foggy appearance. As the cool air is pushed up the mountains, low hanging clouds are formed, giving the forests a mysterious and magical appearance. Cloud forests are the ideal vacation destination for eco-tourists, hikers and birders. Visiting the cloud forests of Costa Rica is quite different than visiting the beaches. Don’t forget warmer clothes, hiking shoes and binoculars so you can explore the forest in comfort and spot the Resplendent Quetzal the spider monkey. The best Cloud Forests to visit in Costa Rica are the Monteverde Cloud Forest Biological Reserve and the Santa Elena Cloud Forest Reserve. Be ready to take advantage of several adventure activities too! 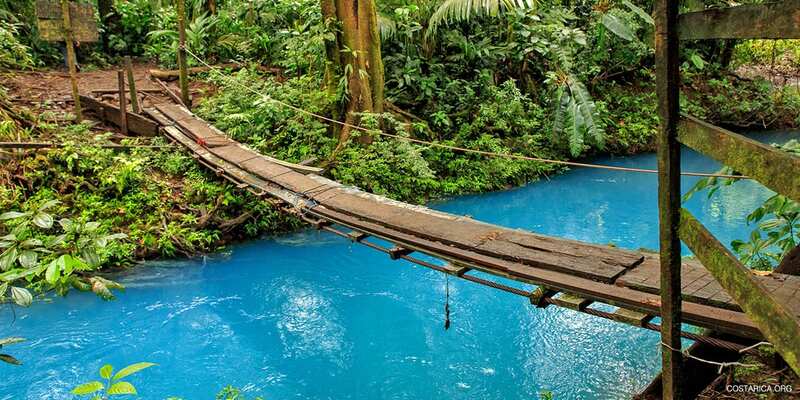 Try zip lining, horseback riding and walking across the famous hanging bridges. Riparian Forests are found next to a body of water and make a great home for both land and aquatic animals. They are very humid and help minimize soil erosion, which controls flooding. You can look for hummingbirds and several other bird species in the Riparian Forests found in the Southern zone of Costa Rica. Mangrove swamps are formed where freshwater and saltwater meet. It creates a unique eco system where the forests are transitioning from dry to wet. Mangrove trees are partially submerged in water and have different levels of tolerance to saltwater. Mangroves provide an extremely important natural habitat for sloths, dozens of bird species, tropical cats, crocodiles and hundreds of marine species. Popular Mangroves are located in Las Baulas National Park, close to Puerto Jimenez on the Osa Peninsula, Gandoca Manzanillo Wildlife Refuge on the Caribbean coast and Cahuita National Park. The best way to explore the mangroves is by kayaking. Don’t try to walk through mangroves—you’ll find yourself knee deep in mud! There are many fun activities for all types of travelers in any of the rainforests found in Costa Rica. See the nature for yourself or let us set up a custom tour with a professional guide. Go zip lining in the cloud forests of Monteverde or kayaking through the rivers and rainforests of Tortuguero. Go birding throughout the dry forests of Guanacaste or relax at a tropical lodge in the Osa Peninsula. Rainforests of every type form an excellent base for life to thrive. Six percent of the world’s biodiversity (Plants and Animals) call these rainforests home. Costa Rica is home to 500,000 species, about 300,000 of them being insects. Some animals found in the rainforests include agoutis, coatimundi, howler and capuchin monkeys, sloths and crocodiles. Discover all you can about Costa Rica animals! Costa Rica rainforests also hold some of the most endangered species of wildlife, Including the jaguars and Baird’s Tapir. However due to deforestation or destruction of habitat, they, unfortunately, have dwindled in the past years. You might also spot the Resplendent Quetzal and Scarlet Macaw–two species of unique and gorgeous birds. Birders come from all over the world to get a chance to see them in their natural habitat.